For the gentleman or lady who is looking to add a touch of gothic flair to an outfit, our gothic buttons and cufflinks make an excellent option. Our gothic cufflinks are nothing if not eccentric, displaying coffins, crosses, and skulls, among other designs. Our gothic pins provide another option, showing off bats and skulls as decoration. Gothic buttons can replace the current buttons on any garment you own, adding unique style, or they can be sewn onto canvas satchels, added to art projects, or used for other ornamentation. Our gothic buttons and cufflinks are perfect for customizing everyday clothing or adding a touch of gothic class to an elegant, formal garment. Alchemies solution to those inevitable moments of formality. 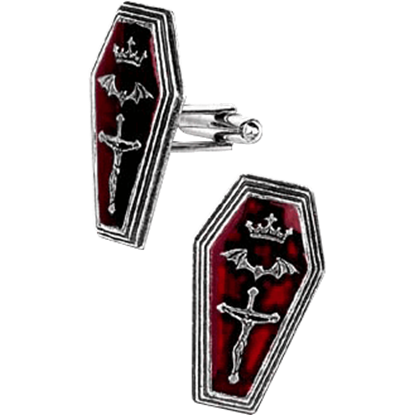 Vampiric nobility with blood-red enamel, the Immortal Kist Cufflinks are the perfect accessory to your formal wear when you just have to add your own vampiric touch! Do you ever feel like adding your own gothic touches to your attire? 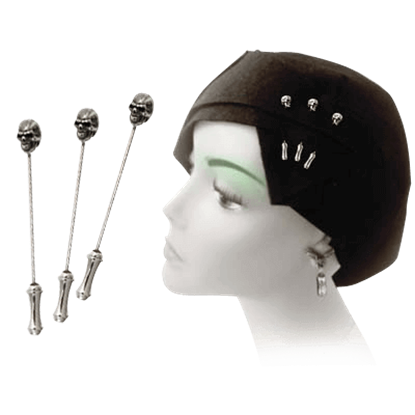 If so, perhaps you ought to pick up a few of these Memling Skull Dress Pins, which make adding a bit of great gothic style to your look as easy as one, two, three! This alternative safety pin offers a strong and distinctive way to fasten your clothing or belongings. 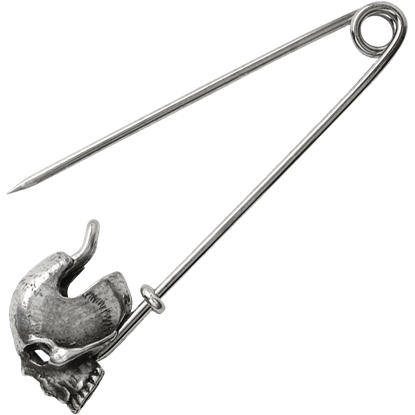 The Skull Head Pin makes an excellent kilt pin or cloak pin while providing your look with unforgettable gothic style. Sometimes the understated and subtle accent is the best one you can feature. 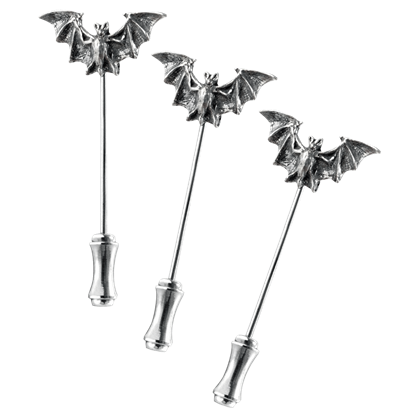 These Vampire Bat Dress Pins are a casual and easy-to-wear accent that is perfect for effortlessly infusing gothic style into every look you might wear.